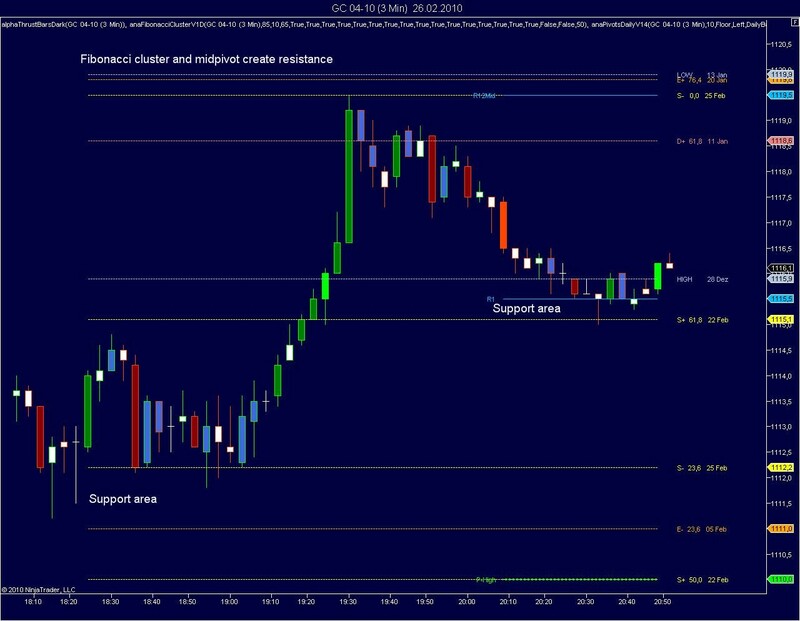 Indicator displays Fibonacci retracements and extensions for intraday charts based on swing highs and lows. Labels: Fib lines labeled A&dash;E are calculated from 5&dash;day primary swing highs or lows, those labeled S refer to a recent swing high and low of order 2 or 3, those labeled Y and Z are calculated from swing lows and today&apos;s high and low, if applicable. Extensions from highs and lows that have been taken out are labeled X, you will also find additional support and resistance from prior swing highs and lows that have been taken out. An example: "D+ 76.4 (28 Jan)" means that prices touching this line have retraced 76.4% within a Fib retracement defined by the swing high from January 28 and the lowest low between this date and the end of the session of yesterday. Multiple Lines: All Fib values are rounded to full ticks. If several Fib values are rounded to the same price, the indicator will display "Multiple F-b" and display the number of Fib lines. Lookback period: The indicator will only take into account Fib retracements within the look back period of the chart. You can increase or reduce the look back period of the indicator via indicator dialogue. Filter: The filter can be set to values between 0 and 100. Default setting is 85. If a swing low defining a Fibonacci retracement occurred 100 days ago, all lows during the following 15 days will be ignored, only lows during the last 85% of the 100 day range will be used for Fib retracements. If you do not want to use the filter, you may set it to 100. Select your lines: Before using Fib retracements you should check all the lines. If there are labels you do not need, you should unselect them within the indicator panel. You can also reduce the lookback period of the indicator to reduce the number of lines.